REBECCA & COLIN – This multi award winning and multi-lingual duo can be described as one of the world’s most unusual double acts. Together with “Joe”, Rebeccas´ 18th century cello, they perform spoofs of everything from Pop to Opera and Jazz to Bollywood. You can find details and photos about this title in our EPK below. Sometimes nothing happens for decades and then a whole century passes within a week. All of a sudden, the events are overturning and you don’t even know where is up or where is down! So it is with Carrie Puddleton and Lawrence Longstaff, the cellist and the chorus singer who are the only two members of the Royal Imperial Victorian Opera Company from good old England, who managed to reach mainland Europe. Brexit claims more victims! 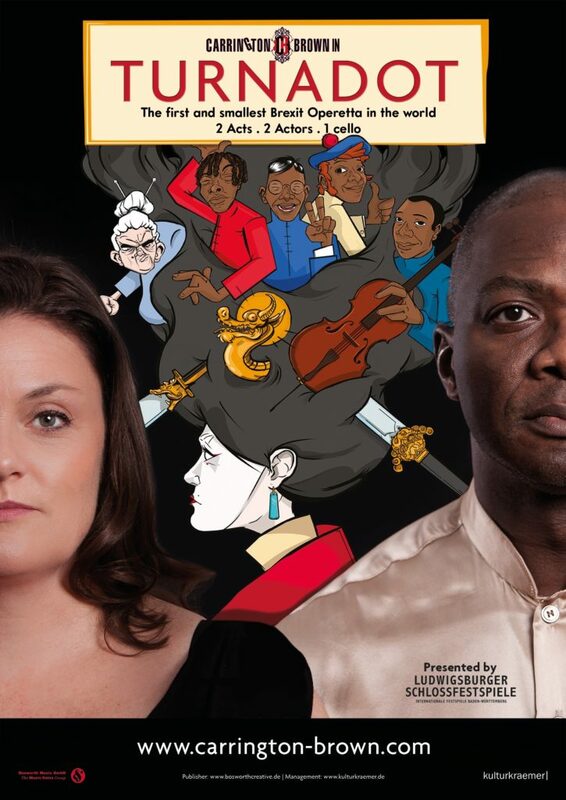 The music and comedy duo Carrington-Brown, alias Rebecca Carrington and Colin Brown, together with the ingenious cello Joe, have spun a turbulent operetta that not only deals with the hair-raising motifs of the old Persian fairy tale, but also targets current European politics.